Couple reveals how they finally overcame fertility problems to become pregnant at the same time, giving birth just two days apart. 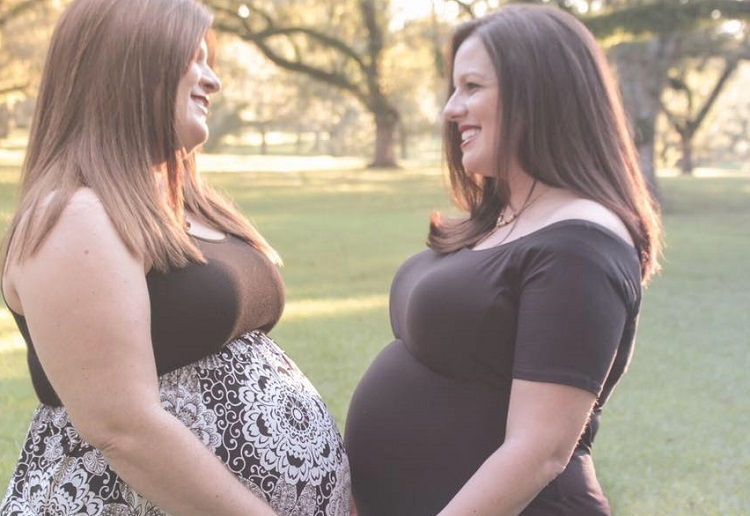 Anna and Renee McInarnay, 35 and 36, from Hattiesburg, Mississippi, US, both underwent IVF treatment, and were told they had just a 38 per cent chance of success because of their ages. Renee had an even lower chance as she also had polycystic ovary syndrome (PCOS) and so neither believed that conception could be a ‘real possibility’. The couple documented their struggle online and said they often received abuse from trolls, shares Daily Mail. The couple, who have been together for 18 years, said the news was a ‘miracle’ and went on to attend birthing classes together, even planning to welcome their little ones into the world on the same day. Due to complications, they both needed c-sections after long labours and decided to give birth separately. On Saturday October 13, Emma Reese was born to Renee. She weighed 7lb 13oz. Anna then gave birth to Avonlea Grace, 7lb 1oz, a mere two days, seven hours and 48 minutes later. The couple say they have been criticised online for being pregnant at the same time – even though neither expected it. However, they sat that they have received positive feedback and well wishes from people in their everyday lives. The couple hope their story will offer hope to other families struggling to conceive. Anna added: ‘The fortune we have had has laid heavily on our hearts, it’s not lost us that we had this amazing opportunity. ‘We want everyone trying to have a family to know that our hearts are with them. ‘We had an amazing experience where some people struggle for years and years. How lovely, I wish them all the best. Congratulations on your 2 beautiful bubs and congratulations on all the obstacles you both overcame to be able to be where you are now. This is so beautiful. It’s like having twins only being a couple of days apart instead of minutes. Congratulations to them both and welcome to their little girls. OMG, what a wonderful story to tell their kids when they grow up. Just amazing. A miracle really. I love babies!! Congratulations to them. How amazing that they birthed two days apart?! This is such a cute story!! How amazing that both partners get to experience being pregnant and giving birth, then becoming mums to each others kid ???????? Its really no different to any infertile couple trying to have just one baby and unexpectedly getting twins. Why do troll have to stick their nasty noses in? They are a beautiful family. Just like having twins. Congratulations and good luck to this new family. Congrats to them all ! This is so amazing and incredible at the same time!! Congratulations!